Hina Khan and Surbhi Chandna are two of our favourite television stars. Apart from being incredibly talented actresses, these two also happen to be TV’s very own fashionistas. They always score high on our fashion meters and with every new OOTD/OOTN, they are getting bolder and more badass. Recently, Hina who is crazy famous for her ‘Komo Swag’ based on her negative role of Komolika in Kasautii Zindagi Kay 2, shared a boomerang video as part of her Insta story. 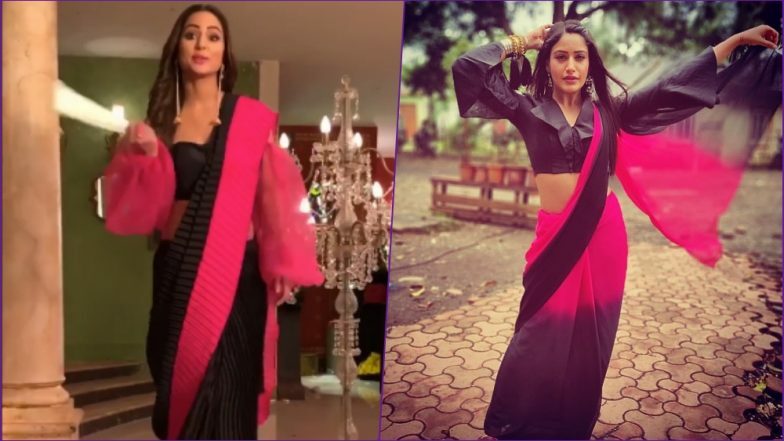 In this post, Hina Khan is wearing a black and pink saree, which will instantly remind you of Ishqbaaz girl Anika aka Surbhi Chandna who had sported a similar saree a few months ago. Surbhi Chandna Borrows Hina Khan's Pink One- Off Shoulder Outfit and We Want You to Decide Who Wore it Better - Vote Now. It is television most-sought-after actresses, Hina Khan and Surbhi Chandna in our latest fashion faceoff. And the outfit under the spotlight is a gorgeous black and pink saree, which both our lovely ladies have worn in a contemporary fashion. Hina who for almost a decade wowed television viewers in her traditional saree look as Yeh Rishta Kya Kehlata Hai’s Akshara has given a new spin to the whole saree game. Hina Khan, Surbhi Chandna & Jennifer Winget in One Frame at Indian Telly Awards 2019 Was Such a Treat! View Pics. Hina as new-age Komolika is seen draping the six yards but with a twist. She had recently worn a hot red saree with a churidar during a special episode of KZK. And this time around, Hina cuts a pretty figure in a two-toned saree. The 31-year-old is wearing her saree with an off-shouldered blouse with dramatic sleeves in black and pink colour. She is wearing a pair of statement long chain drop earrings to finish her traditional yet very chic look. Coming to Surbhi Chandna, the Ishqbaaz actress is popular for draping sarees in the chicest way possible. During her stint as Anika on Star Plus’ hit daily soap, Surbhi had set major saree goals especially those blouses with modish designs. However, one such look from her Instagram handle that her die-hard fans remember even today is this pink-black saree pic. The 29-year-old wore a billowy full-sleeved crop top with her saree. While the saree material and the way Surbhi has styled her look is very different from Hina Khan’s OOTD, the colour and silhouette draw a similarity between the two divas. We feel both the actresses have nailed this contemporary Indian look perfectly. What is your take? Hina Khan or Surbhi Chandna, Who Wore it Better?